One for the outsiders, retro enthusiasts, the indie kids who need a little spangle, and for anyone daring to sound different. As with all Danelectros, it's an acquired taste. Like all Danos, the '59M Spruce might be new, but its looks are pure post-war Americana - with its 'Coke bottle' headstock, short horn double-cut body, '56 Lipstick pickups, and the groovy 'seal- shaped' pickguard. For one, the '59M eschews Dano's traditional rosewood saddle, preferring a neat recessed wraparound bridge and tailpiece. And the semi-solid Masonite build is augmented here with a spruce top, frame and soundboard, while a single f-hole is offset against the bass side. In classic Dano style it's still as light as a packet of smokes, and it's also bright - really bright. With either pickup selected, the '59M Spruce has an abundance of trebly bite, and it may well take a little adjustment of your set-up to get the best out of it. Though the pickups are lower in output than most single coils, there's plenty of character to be drawn from them. Through a clean valve amp, there's plenty of snap 'n' twang and vintage Americana to be had. Rolling back the tone takes some of the harshness off, revealing an airy, dynamic voice, perfect for re-scoring Easy Rider with some hippy-dippy chord work. Upping the gain to the point of break-up finds a sweet spot for scratchy blues and rockabilly. The C-shape maple neck feels super-thin and navigable, making it a lot of fun pulling out those syncopated rockabilly doublestops. Where it comes into its own, though, is when both pickups are selected; the extra output of both pickups in series reveals the '59M Spruce's rebel heart. This extra muscle comes in handy for classic hard rock. The brightness is still there of course - and those '56 Lipstick pickups combined with the aluminium nut can get a little unruly at high volume. But there's also a nice sinewy bark that will please the greasiest garage rockers, and offer a stairway to the sort of power that Jimmy Page tapped into when he famously employed an original '59 DC. 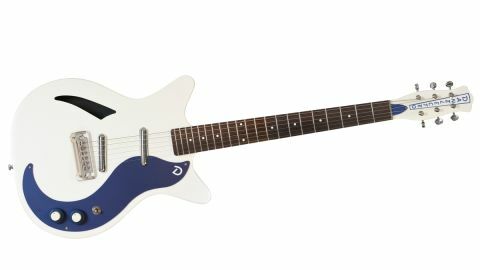 Danelectro's USP lies in both a sense of vintage authenticity and overt individualism. Its guitars were the affordable alternatives to more traditional fare with a style that was super-modern at the time. 60 years later Danelectro guitars are more of an exotic anachronism, an acquired taste with a relatively steep price tag (although it's closer to £500 on the street). But that was always part of the appeal, and there's no question the '59M Spruce is a handsome throwback of a guitar with a bold vintage tone.